Boxer & Gerson Partners Michael Gerson, Gary Lee, Maria Sager and Gary Roth were joined by Associate Dikla Dolev in addressing an audience of union shop stewards at the East Bay Municipal Utility District (EBMUD) on Wednesday, July 12. 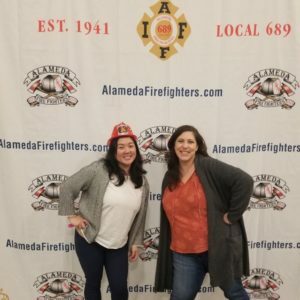 The veteran attorneys were invited by Union Local 2019 staff, who were joined in the audience by members of Union Local 444. The two unions represent different classes of EBMUD employees. The event was held at the EBMUD offices in downtown Oakland. Roth, the only personal injury specialist in the quintet, started off the two-hour program with a review of personal injury law as it applies in the workplace. He was followed by certified workers’ compensation specialists Sager, who gave an overview of workers’ compensation law, and then Lee, who discussed medical care and temporary/permanent disability. Gerson, also a certified workers’ compensation specialist, offered his perspectives throughout the program, gleaned from his nearly 40-year tenure as a founding partner of Boxer & Gerson, LLP. Dolev then joined in with her colleagues in the concluding question-and-answer session. The assembled employees came from a wide variety of jobs, among them engineers, clerks, inspectors, accounting staff, customer service representatives, lab technicians, environmental compliance staff, dispatchers, construction workers, plumbers, concrete finishers, plant operators, information technology workers and more. Local 2019 is comprised of some 700 EBMUD employees. Both it and Local 444 address the collective bargaining needs of municipal employees working on drinking water and wastewater treatment projects. EBMUD provides drinking water to 1.4 million customers in Alameda and Contra Costa counties, and also operates wastewater treatment facilities that serve 685,000 customers. Gary Roth (back row, left), Maria Sager and Dikla Dolev (front row left and right), and Michael Gerson (next to Dolev) join some of their audience members from EBMUD after their presentation.